1. 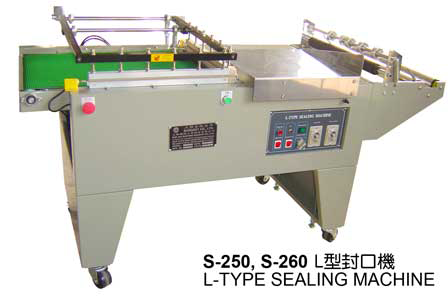 The L-type sealer uses the folding type of shrink film in roll shape. It need manual to loading the production for sealing. It is designed with automatic delivery. The products are sent into the shrink packaging machine automatically after process of sealing & cutting is finished. 2. The sealing device is action by a pneumatic cylinder. We need manual to put the packing article into the middle of the shrink film then push the start button to let the sealing frame downward to sealing the film and after the heating time. It will open the sealing device in auto. 3. The sealing & cutting control is using of instantaneous heating. Speedy sealing & cutting, electricity saving. Available to change the sealing time & cutting and temperature required upon the thickness of plastic film. 4. 3 sections temperature control (high, middle, low) keeps the sealing line in good situation. 5. Conveyor height for L-type sealer can be adjusted. Its sealing height can be adjusted depends on product’s size in order to made a prefect sealing effect. 6. Customized specifications are available for large products. 7. The standard is impulse heating type sealing method. We also accept the direct heating type order when you have any necessary.